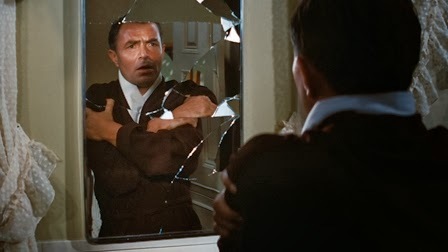 Englishman James Mason co-wrote, produced and starred in this terrifying fifties issue drama from Nicholas Ray - fresh off Rebel Without A Cause (1955) - about a suburban American primary school teacher whose life disintegrates when he becomes addicted to prescription cortisone. Mason is electric as Ed Avery, a mild-mannered educator and caring pater familias transformed into a monstrous domestic tyrant by the supposed wonder drug - erratic, arrogant, aggressive, twitchy and paranoid. 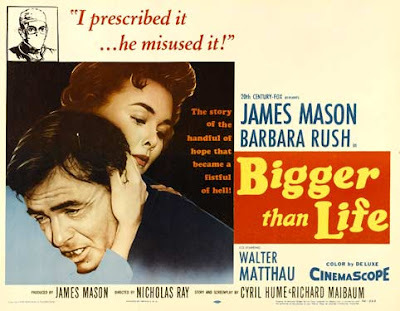 Often films built around their star's central performance can topple over into egomania and self-indulgence but Mason is simply towering here and was quite possibly never better. He's ably supported by Barbara Rush and young Christopher Olsen, however, as his increasingly frightened wife and son, effectively experiencing a home invasion at the hands of a man who bears little resemblance to the one they love. There's also a nice early role for Walter Matthau as a concerned PE teacher turned gallant woodsman, rushing to their aid when Avery finally succumbs to a megalomaniacal psychotic episode, believing himself to be the Biblical Abraham sent to smite his own flesh and blood, a scene played out as the family TV set blares a sickly funfair theme. If there's a more ominous line in film than "God was wrong", I haven't heard it.